Yoga Teacher Training at Your Local Yoga Studio- Refresh! Looking back, deciding to signup up for yoga teacher training was one of the best decisions I have made in my life. It was a decision I made for ME. I chose to invest both time and money in myself and in my yoga practice. 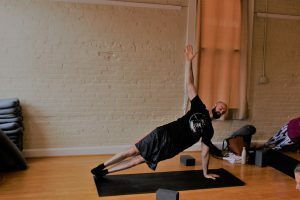 I was on the fence about yoga teacher training for over a year. It was something that I wanted to do, but it was something I was afraid to do. I remember making lists of reasons why I shouldn’t sign up: it costs a lot of money, it is a huge investment of time, it will not fit into my work schedule, etc. However, I never completely ruled it out because in my heart, I wanted to attend. In the summer of 2015 everything fell into place, I did my research and found a yoga teacher training program at a local studio near me that fit (enough) into my work schedule. I did not know much about the studio at the time, so I decided to attend a class at the studio taught by the instructor that would be leading the training. I felt welcome in the studio and co uld feel the sense of community from the moment I walked into the door. After the class, I was hooked. I loved the style of yoga that the instructor taught and was excited to learn more. Teacher training deepened my love for yoga and positively impacted my practice. The journey helped me realize that yoga is different for different people and that yoga has the ability to give us what we need when we need it. I learned so much about myself, my body, and the world around me during my training. I started to recognize when destructive thoughts entered my head and when I would engage in destructive behavior; I became more of an observer. In order for yoga to give us what we need, we have to be able to identify what we need. Before teacher training, I thought that I was in touch with my body. I was able to name the sensations I was feeling. However, I did not listen to what my senses were telling me. Before teacher training I knew that I had scoliosis. However, I did not consider this known fact when I practiced and did not cater my practice to best suit my body’s needs. The inequality/asymmetry in my body calls me to an “unbalanced” practice. I now focus on strengthening my weak side and stretching my tight side. I let my needs dictate my asana instead of the other way around. My attention to breath has also drastically changed. My breath was extremely shallow when I first started teacher training. Practicing pranayama helped me to deepen my breath. My new found attention to breath helps me to stay present during my practice. Yoga became more than a workout during my training; it became a lifestyle. I am eternally grateful for my teachers and for the friends I developed during my training. Every fellow trainee brought something unique to the table. We all had different struggles, unique strengths, and dissimilar backgrounds. But, we all had the same passion for yoga and compassion for each other. We became a family. Refresh Yoga Center offers a great 200 hour yoga teacher training course that can fit your time and budget. Stop in to take a few yoga classes to see if it’s the right one for you. When you find the right one, you will know! Don’t question your instincts; take a deep breath and go for it! You will not regret it! 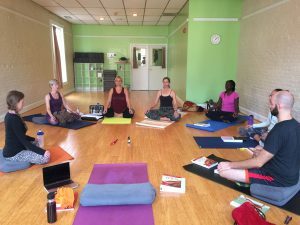 Teacher training is not just for future yoga teachers. Teacher training will provide you with the tools you need to lead a successful yoga class, speak in public, and to develop a fruitful business. 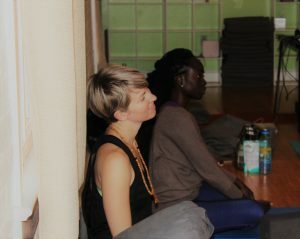 But, most importantly, it will provide you with an opportunity to deepen your practice and elevate your self-awareness. Do not set expectations for your training. Be receptive and accepting. Have an open mind and a welcoming heart and you will learn and grow! Remember, the end of teacher training does not mark the end of learning. I continue to learn something new every time I practice. Yoga teacher training helps to view yoga through a different lens. The people I met in yoga teacher training will always have a special place in my heart. I am thankful for their vulnerability and support throughout the entire course. I would not have been as successful without their help. Yoga teacher training exposed me to ayurvedic practices and the benefits of establishing a daily routine. The idea that small changes in your diet and the incorporation of regular rituals into your daily activities could positively affect your overall well being resonated with me. While in training, I modified my diet using herbs and spices and developed a simple morning routine. These small changes helped me to introduce some consistency into my transient work travel schedule. 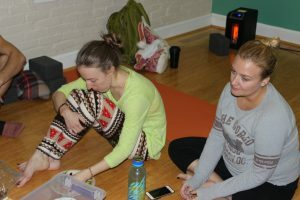 You can start your deeper understanding of yoga and yourself with the next 200 Hour Yoga Teacher Training at Refresh Yoga Center in Old Town Alexandria, Virginia. Learn to become a yoga instructor or simply become more advanced in your own practice. Study at a local yoga studio near you on beautiful, bustling King Street.